PRODUCT: Western T272 Grade Stitch-Bonded Polyester Reinforcement Fabric, Fine Weave, Soft-Finish 3-Oz / Yard. 4-inch X 324 ft. Roll. Price/Roll. 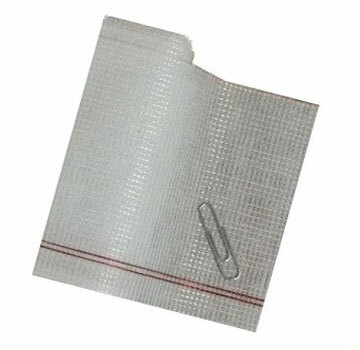 USE: This reinforcement fabric is a stitch-bonded heat-set polyester high-performance reinforcement fabric. Its commonly used with liquid roof coatings to create a solid reinforcement layer. Its oompatible with liquid solvent-based asphalt roof coatings, water-based emulsion coatings, cold-applied built-up roofing, elastomeric roof coatings and other liquid roof maintenance and restoration systems. It is one of the strongest yet flexible fabrics available for adding reinforcement to seams, panel overlaps, splits, joints, cracks, protrusions, and flashings. The soft grade of fabric is very pliable and designed to conform to irregular and dissimilar surfaces, yet lay flat. The fabric has high absorption capability, allowing liquid coating materials to quickly wet into and become encapsulated, forming tough waterproof details and reinforcements. Limitations: Thick products do not wet well to the fabric. Aluminum flake containing products should be applied as topcoats only (not with the fabric embedded). Color: White to off-white. NO alignment stripe. OPTIONS: Stocked in 4, 6, 20 and 40 inch widths. Also in T326 Firm Grade and T325 Extra Soft Grade.